What is the value of a science PhD: Is graduate school worth the effort? Is a Science Ph.D. a Waste of Time? Don’t feel too sorry for graduate students. It’s worth it. What does a doctorate do for you these days? Few people spend 11 years in college. Most stay for four or five before the urge to leave campus and earn a salary kicks in. Barring a thesis defense meltdown, I’ll be one of about 50,000 graduate students across the United States and Canada to get a Ph.D. in science this school year. After seven years in graduate school, I’m left wondering if the time and effort was worth it. What do scientists do these days, anyways? According to several recent reports, not much. The problem, stated last month in the Washington Post, is that academic jobs have all but disappeared. A 2011 report in Nature concurs: “People who have trained at great length and expense to be researchers confront a dwindling number of academic jobs, and an industrial sector unable to take up the slack.” A 2010 article in the Economist subtitled “Why doing a PhD is often a waste of time” is even more damning of doctorates. To be fair, that article targeted all Ph.D.s, but the reporter made science doctorates seem particularly worthless, writing that she “slogged through a largely pointless PhD in theoretical ecology.” After crunching the numbers and talking to about a dozen people with science doctorates, though, I’ve concluded that for everything these accounts get right, they get just as much wrong. In short, science Ph.D.s are just about the last group of people the media should be worrying about. Let me explain. Almost everyone agrees that academic jobs in the sciences are scarce. Over the past 40 years, the number of doctorates pumped out by universities each year in the United States has increased while the number of academic positions has declined. 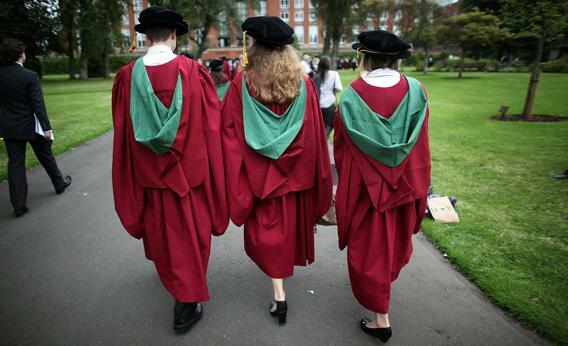 There are more people with Ph.D.s and fewer professorships. As Nature reported, in 1973 about 55 percent of people with doctorates in the biological sciences got stable academic jobs; in 2008, the National Science Foundation pegged that number at 14 percent. Across all scientific fields, NSF data suggest that only about 23 percent of Ph.D.s land tenure or tenure-track positions at academic institutions within three to five years of finishing grad school. If you assume that every science Ph.D. wants a career in academia, this seems like a dismally low employment rate. But academic jobs aren’t as coveted by people trained in science as you might think. Although it’s unknown how these preferences translate into the careers people actually pursue, the implication is that only about half of doctoral science students are really gunning for academic positions. NSF data support this. In 2010, about 50 percent of new science Ph.D.s went on to do postdoctoral research at a university—the contract job long considered a necessary step for landing a professorship. There have almost always been more doctorates than academic positions, and Ph.D.s, unlike J.D.s and M.D.s, have a long history of pursuing a range of careers after their training. A science Ph.D. is still an attractive credential outside of the university. According to a 2008 survey by the NSF (a summary is available here), there were about 662,600 work-ready science Ph.D.s in the United States, and only 11,400 of those people were unemployed. That’s an unemployment rate of 1.7 percent. Of course, some of those jobs have disappeared since the NSF survey was taken. The pharmaceutical industry, the Washington Post reported, has cut scores of chemists. Even so, the American Chemical Society told me the unemployment rate among its Ph.D. members is 3.4 percent this year, down from 3.9 percent last year. During these rough economic times, the unemployment rate of scientists in one of the hardest hit fields is less than half the national average. Why? Because scientists learn more in graduate school than how to peer into microscopes and pour chemicals ever so carefully from one Erlenmeyer flask to another. As one biologist told me, the statistics and computer programming she learned during her degree can be applied just about anywhere. More generally, scientists know how to solve complex problems, and finishing a doctoral dissertation shows that you can get things done. The employment rate of science Ph.D.s makes the Washington Post’s claim that “the jobs aren’t there” seem strange, almost as strange as the paper’s statement that a science Ph.D. “can leave graduates buried in debt”—it almost never does. The majority of science doctoral students receive government grants, university stipends, teaching assistantships, or research fellowships through their adviser’s grants that cover living expenses and pay tuition. In a study of people who earned Ph.D.s in 2010, about 75 percent of life sciences, physical sciences, and engineering doctoral recipients had zero education-related debt. Still, if you pursue a doctorate in the sciences purely for future financial gain, seven years of lost wages—the average amount of time science Ph.D.s spend in graduate school—might not be worth it. This income loss is especially true for scientists who stay in academia after graduating. Postdoctoral fellowship positions pay 30-year-olds with more than a decade of higher education about $40,000 a year, and they don’t guarantee an academic job. And in 2008, the median salary of fully employed science Ph.D.s, the NSF reported, was about $100,000 a year. (Chemical and computer engineers, in case you were wondering, make the most.) That’s a great salary, of course, but much less than what people with MBAs and M.D.s earn. But focusing on this hypothetical financial loss ignores why many graduate students pursue a Ph.D. in the first place: intellectual curiosity. The biggest perk of graduate school in science is getting paid to learn. Many of the people I spoke to missed the intellectual and logistical freedom of graduate school—being able to set their own hours and pursue a wide range of academic activities. Nobody expressed regret about working toward a science Ph.D.; graduate school, most said, was a lot of fun. I’d have to agree. You might argue that if I leave academia to, say, teach high school or become a journalist, I’ve wasted my laboratory training. This argument is ridiculous. Since the Ph.D.’s inception in 18th century Germany, the product of a doctoral education has been a dissertation—a body of research that, in a small way, moves a field forward. There’s nothing wrong with contributing to science and then moving on. The work won’t disappear. Dissertations are published, and doctorates last a lifetime.